Jeri’s Organizing & Decluttering News: Tote Those Files! So I passed it along to copywriter Mary Knippel (who also runs a few different workshops), and she's very happy with it! 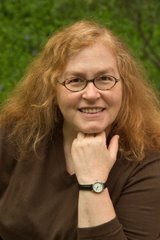 She just sent me a thank-you note, saying, "The portable file is a great way to keep all my research and writing projects organized. I have everything I need at my fingertips at the computer, or I can easily carry my work into another room." My only concern was that the hanging file rods, which make this product so sturdy, also add a bit more weight than I anticipated. 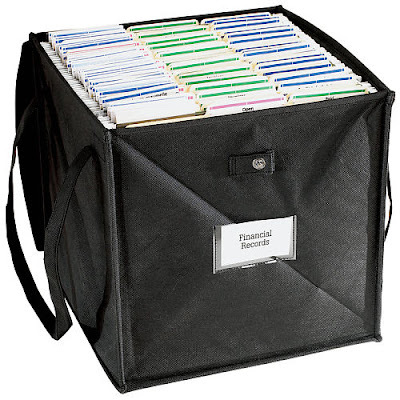 I just went searching for any other totes that accommodate hanging files, and the only place I'm seeing anything at all similar is Lillian Vernon. See Jane Work and Grandin Road both carried leather file totes in the past, but don't seem to have them any more. (Update on Sept. 30, 2014: Grandin Road and See Jane Work both carry file totes again.) Real Simple also had a product sold through Target, but I can't find it on Target's web site. Maybe it's an in-store only item. If you can wait a while, and could use something that might be less heavy-duty, Linda Hecht (pronounced heck) is coming out with her Hecht of a File Tote. It comes with a removable lightweight file frame for letter-size hanging files. Linda expects the totes will be available in three to four weeks. They sure look pretty! Update on Sept. 30, 2014: I'm no longer finding Linda's products. Here's another option - nowhere near as lovely, but practical in its own way: the Fold 'N Hold Pop-Up File Tote. It's widely available; this picture came from Toys R Us, of all places! Update on Sept. 30, 2014: I'm no longer finding this product anywhere. 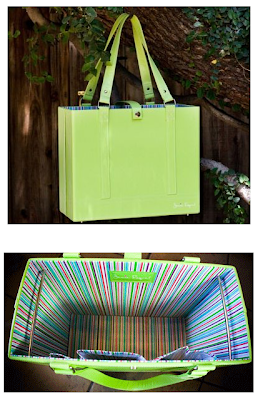 Now there are other products called file totes, but they're quite different; more on that in my next post. I really like the first one! You can be organized and cute at the same time :) Thanks for sharing! 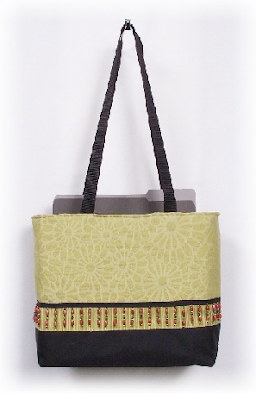 Glad you like the tote, Michelle!